Award-winning Travel Blog featuring Road Trips, Motorhome Travel, tips, ideas & inspiration! Is Norway Expensive to visit by Motorhome? Ever since we announced our plans to visit Norway in our motorhome, we have been swamped by people sucking in their breath through their teeth before looking pityingly at us and saying “Norway huh? That's going to be expensive…” But is that true? Is Norway expensive to visit in a motorhome? Well, the results are in! We have now received and reviewed all the bank accounts, credit card statements and toll fees. Basically, I've spent the last two weeks in paperwork, trying to figure out how much our little expedition cost us. This has literally been me… and people wonder what I do all day! Ha! So- how much does it cost to tour Norway in a Motorhome? What are the fuel costs in Norway? Other things we paid for in Norway. How else can I help you today?? Our Motorhome is OVER 3.5tonnes. If you can avoid this, do- it makes the tolls sooooo much cheaper! Having said that, we love the space and the ability to not worry about how much we pack. We also have a trailer with two big motorbikes on it. As everything in Norway is based on length (no sniggering, thank you!) this again made our ferry and toll costs much more expensive. We deliberately stocked up and brought food with us from the UK- only buying necessities as we needed them. Having said that, we considered the trip a holiday, so if we wanted a little treat, we bought it. These costs only cover our time in Norway (2 weeks), not the costs to travel there and back from the UK. I've included the ferry across from Denmark and the costs of getting back into Denmark through Sweden and crossing that famous bridge. We drove a lot during those two weeks- more than many other people would and honestly more than we should have- we were exhausted when we got home!! I added up the expenses in NOK and exchanged them into GBP at today's exchange rate. I've included the NOK costs below, but obviously the exchange rate will fluctuate with time. Is Norway Expensive to visit? Yes- but worth it! This route took us 2 weeks- you can see how much we stopped going up the west side. If you want to see where we stopped in more detail, check out our MAP. It took us 2 days to drive back from near Kristiansund to the Swedish border. The route through the centre of Norway is MUCH quicker- there are no ferries… but there are more tolls, so it probably costs about the same. Guess it depends whether you want to take the scenic route or the quick route. Here's a list of all the ferries we used and how much they cost us. Remember we are a 7.5m motorhome with a 2m trailer, and I believe the price break is 6-8m, then 8-10m. To get to Norway, we used Colorline and crossed from Hirsthals- Kristiansand. This cost £409.56. For more information on taking the ferry from Denmark to Norway, our post and video about it are here. How expensive is Norway? Worth every penny for this view! Before we left for Norway, we ordered a Brobizz toll pass. We debated which one to get, but in the end, we went for a business tariff, as our vehicle was over 3.5t and we didn't want to risk getting caught saying we were less. As it happens, we were never checked at all- but we would rather play it safe and not have to worry about it. The Brobizz also works in Sweden, Denmark and Switzerland, which makes our life easier for future travels and allows us to pass through toll booths without having to stop or find change. They take the payments from your card automatically and send you a bill a few weeks later. In total, we went through 23 tolls during our trip- and over half of those were on the E6, which is the main road running North-South through central Norway. Having said that, those tolls only amounted to £84.88. The other tolls in Norway (around the western edge) came to a whopping £20.06- not bad for 12 days driving! But these are the roads with all the ferries on. Word of warning, the Oresund Bridge and the A/S Storebaelt, which are the big bridges from Sweden to Denmark, costs us £275 one way. I've included this in the figure for the final tolls. Our fuel came to £307.72 and we roughly used 277 litres. I know we filled up before we entered Norway, but I have no way of knowing how much fuel was in the tank when we left. Our mileage was (very roughly) 1,490 miles, which works out at us doing around 24.4 miles to the gallon. Honestly, on those windy roads and in that appalling weather, plus towing nearly a tonne of motorbikes and trailer, we're quite pleased with that! As I mentioned above, we didn't buy much food in Norway at all over the 2 weeks. We bought the odd hot dog or bag of sweets at a fuel station and a lot of bottles of water. Our shopping bill for food, water and sweets (there were a LOT of sweets!) was £152.21. And surprisingly, we didn't eat anywhere near as many tins as I thought we would! I stocked up with over 90 tins of various meats and sauces, and we didn't even eat a third. We also drank 3 bottles of wine we had on board, so I'll be conservative and we ate about £60 worth of food we already had with us. Which gives us a bill for two weeks food of £212.21. £88 on gifts and keepsakes. £102 on entrance to the Flamsbana railway, voted the most beautiful train journey in the world. You can see whether we thought it was worth it HERE. We paid £29 fuel for motorbikes and the generator. We spent £16.7 on LPG refillable gas. So that's it- our epic tour of Norway is finished. It's really weird when you actually get to tick something off your bucket list and we're so pleased and grateful to have been able to do that. We didn't get as long to explore the country as we would have liked, but that just gives us a reason to go back! If we went back, we would try to travel less and explore more. I know that might sound weird, but I feel like we put ourselves under too much pressure to get all the way up to Trondheim, when actually we would have enjoyed spending more time hiking and exploring. Having said that, the weather was HORRENDOUS (aka- a perfectly normal Norwegian summer) and neither of us enjoys hiking in the rain. So we would probably have driven just as far! I am actually pleasantly surprised by how little the trip cost us- we were worried it was going to completely break the bank. Is Norway a cheap country to visit? I think that depends on what you want to do and how you are doing it! If you have to hire a motorhome, I've heard it can be very expensive. If you are road-tripping by car and need to pay for accommodation, that could be expensive too, and meals/ drinks out are quite expensive. But if you are bringing your own vehicle and are camping (either by tent or van) and are cooking most of your own food, then no- I don't think it's scarily expensive. You can definitely buy food fairly reasonably (it's probably equivalent to shopping in Marks and Spencer or Waitrose- high end food stores for my non-UK readers!) Two weeks in Norway was not much more than 2 weeks in Germany! 20 Road Trip Accessories to enhance your travels! Road Trip Quotes - 56 Funny & Inspiring Quotes for your adventures! 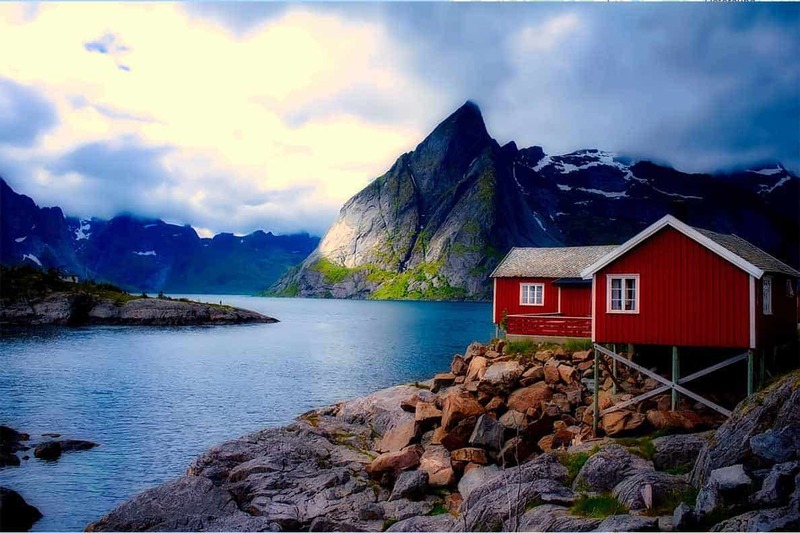 Have you ever been to Norway?? Would you like to?? Let me know in the comments below. Thankyou so much for this very informative blog. It certainly is on my bucket list, hopefully we will start planning next year and go in 2020. We have been to Tromsø early this year and saw the Northern Lights and it certainly fuelled my desire to return. Can’t wait to get our motorhome on the journey of. A life time. Fantastic! Sounds like you’ve got a brilliant adventure ahead. Hi, I am an avid reader of your blog posts, but not very good with the technology… I Remember seeing a fab clip on video of you catching fish in Norway, and can’t find it again! I would like to show my husband so he could put a bit of fishing tackle together. We intend to go to Norway in May, and your posts have been extremely helpful to us. Thanks for putting all the hard work in to enable us to have your knowledge. Sadly Sue, we never caught a fish in Norway- the weather was too bad for us to even bother! 🙂 Thank you for your kind words and I hope you have a wonderful trip. Ah, that’s why I couldn’t find it! Not only bad with technology, but let down by poor memory too! Anyway, keep up the excellent work, it’s always good to get another point of view about places we have visited, enough to make us want to return, and places yet to visit. Our bucket list of places to go is getting longer by the minute. Thankyou for such a useful and informative post, you’ve taken the uncertainty out of what could be a trip spent worrying about overspending. Shame about the weather you had. We’ve been to Norway on a cruise ship and loved it but would love to explore with the motorhome. You’re very welcome Lynne. So pleased you found it useful 🙂 Hope you get there with your motorhome one day! Great read, my wife & I were two weeks behind you for seven week but went through Sweden as far up as Senja. Hardly any rain until south Norway. Still waiting for the tolls but £3120 so far in our 5.98m camper van. Yes, we were unlucky with the weather, which was a shame. You’ve done very well lasting 7 weeks on that- great job!! Thanks for providing this breakdown of costs Kat. I’m really surprised I thought it would be double that, but as you point out it depends on how you are travelling I.e. your own motorhome and taking food with you. Very true! I think that makes a big difference in a lot of places, as it’s the eating/ drinking out which often makes the difference. That, and the tourist entrance fees- but we didn’t do many of those in Norway. To be fair, we didn’t find many to do!! We went to Norway last year. We drove up through Sweden and back slowly through Norway. This year we went again but stayed in the southern part and explored more. Next year we’re going back again and going a little further north than this year. Love it! Fantastic!! Where’s been your favourite place so far?? Sorry to hear you had vehicle troubles. That’s never fun. Thank you for a very detailed account of your great trip. Always enjoy your form of writing and your wit. Keep it up Kat. Reading this post brought back great memories. We spent just over a month touring Norway in our camper a couple of years ago. Like you, in hindsight we did far too much driving, we were determined to get to Nordkapp! I agree that eating out is expensive, we kept it to a minimum, but the ability to free camp in amazing places saves you a fortune. We also loved the free service points as well. I would definitely encourage anyone to go and visit, we loved it! So far, we've explored 15 countries and travelled over 25,000 miles- mostly in our Motorhome or on Motorbikes. When I'm not travelling, you can find me on our boat in the UK, generally in my pyjamas and trying to stop our puppy chewing...well, EVERYTHING! If you're new to the blog (and my... errr... wit??!! ), visit the Start Here page to find out more about me, us and this crazy adventure! Want UNLIMITED access to our FREE resource library? With downloadable Checklists, PDFs and planners, it contains everything you need to plan your Road Trip! We work hard to make this blog the best it can be. If you've found it useful, please consider buying us a coffee to show your support. Thank you! Click here to see our Privacy and Disclosure Policy.